The Fila megastore rang my bell. Mr. C (official child of janiqueel.com) loved it. But then, he had many favourites among the state-of-the-retail-art shops in the brand new VivoCity B1 Retail Extension. 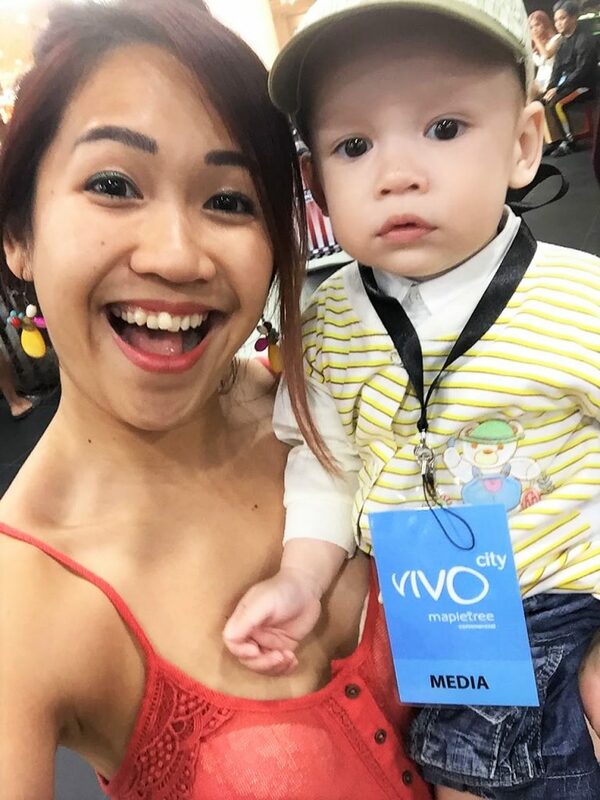 We had a tour last week with VivoCity’s PR agency, W Communications, which made Mr. C and me feel pretty special. Guided tour. Pretty special. Led by Lauren and Aly, assisted by Zen and Qi Min, we saw it all bouncing in and out of attractive shops. Crawling, Mr. C found, is a sure way to sense the shopping energy in each store. I walked, carrying my companion on and off. He is not light after awhile, but I’m fairly fit, I think. I exercise every day. I sweat; I change. I sweat; I change. I sweat … you get the idea. The new extension’s array of gear for active people with schedules like mine is right up my alley! 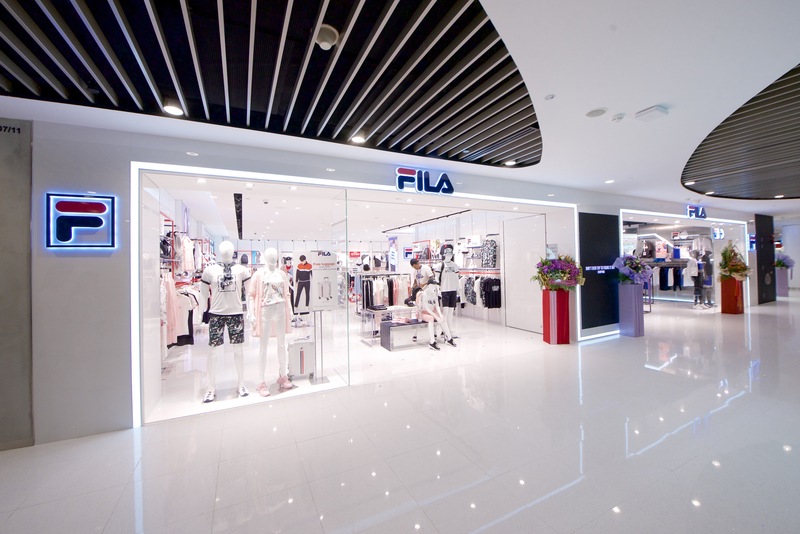 As I mentioned, the Fila store exemplifies the goal of ‘… expanding the retail offerings in the mall to better cater to the evolving needs of shoppers.’ – Gwen Au, Mapletree Commercial Property Management. In splashy fashion, Fila has aimed at the Singapore market like never before. Housing three concepts, the new store hosts venues for street style – FILA FUSION, performance wear – FILA, and children’s duds – FILA KIDS. Housed next to the flagship in a ‘stadium concept store’ performance accoutrements find a home. Flash fun! The easy-to-browse displays highlight the newest releases. Of course there’s expert help. The usual dressing rooms and mirrors are prevalent, too. You can’t get away from yourself if you try. Message: you need me sneakers, My Friend. And don’t forget the trendy apparel to go with them. Finding the right threads for my small crawler was a challenge — Mr. C looked cute in everything. What’s a Mother to do? Like me, he prefers his clothes bright and bold and colorful. There were, say, twenty ensembles that Boy and Mom would have looked great in. Not a whim-shopper, I took my time deciding. 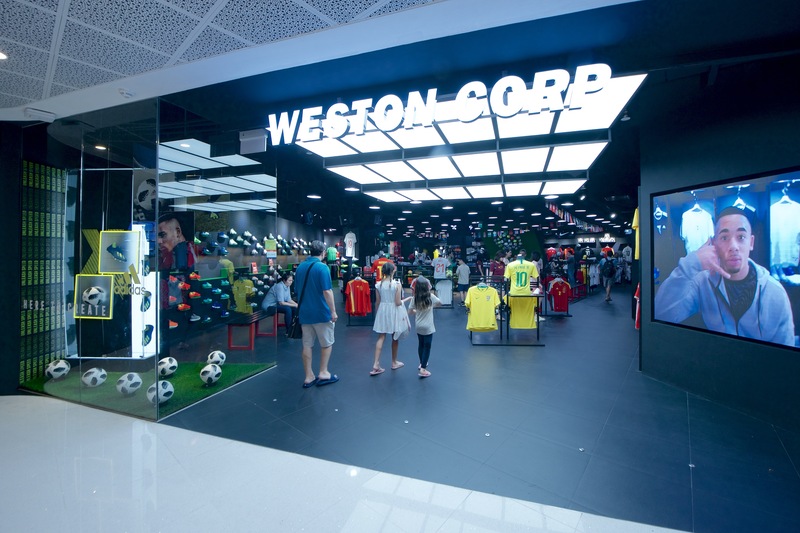 Providing fans with the ‘widest range of football jerseys in Asia’, Weston Corp offers all the team logo paraphernalia that one might wish for. World Cup fever was still a factor on our visit. Of course, Mr. C was an avid fan. His favourite team? England, the green and pleasant land. Was he a bit disappointed, then? Oh, yes. Tears fell. Toothy nubbins were gnashed. Over it by the time of the tour, he fell in love with the brightly-hued jerseys from any team that can be customized to suit. Same same but different is New ERA. 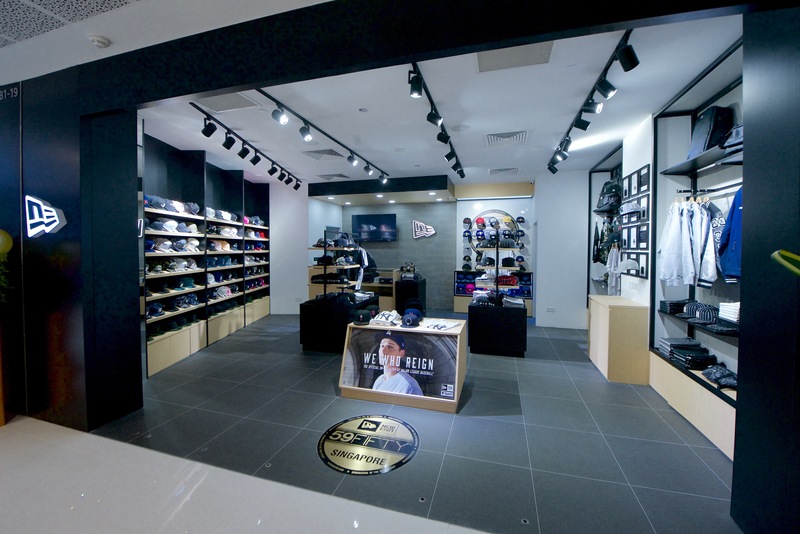 ‘The brand is synonymous with an exclusive range of caps and headwear from well-known heritage sports, lifestyle, film, comics and music brands.’ More USA-oriented Han Weston Corp, this First for Singapore, megastore is a treasure trove of – hats and caps, especially – from every major league team in the West. 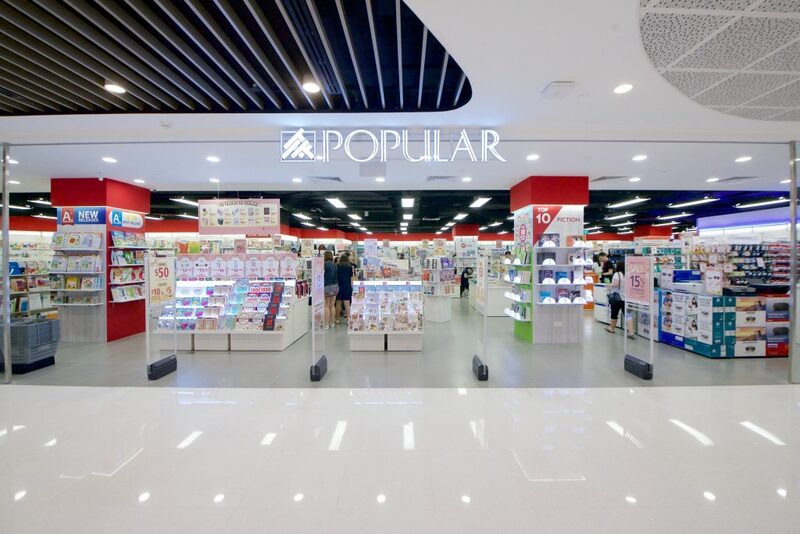 Very popular store – good crawling spaces. 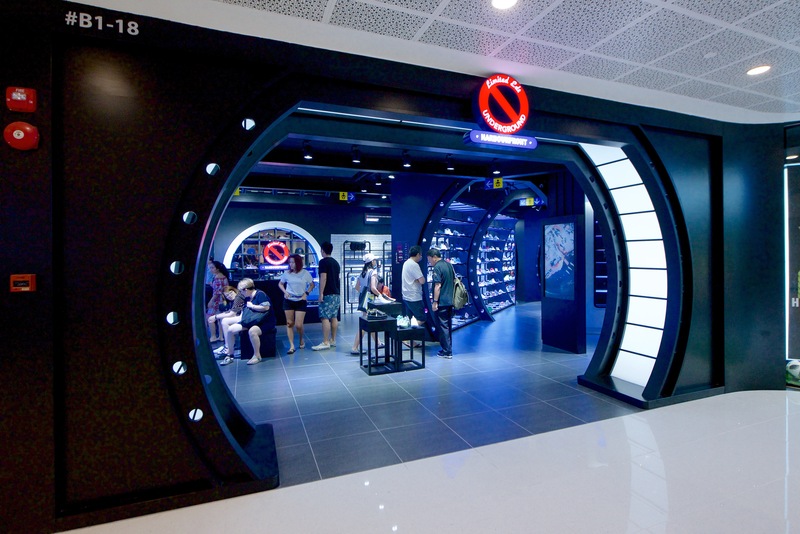 Not to be outdone by attention-grabbing Fila, Nike has built a snazzy store themselves. Chock full of the latest this and that, creatively displayed. The friendly elves assured me that they socked a wide range of uses in a multitude of styles. One section is devoted solely to basketball shoes. L.E. Underground touts a large stock and has style, style, style. ‘The LE Underground store stocks the biggest collection of sneakers in a single store anywhere in Singapore.’ That’s what the VivoCity website says. Nike and Fila zero in on their own brand. L.E. Underground has all, or almost all, or the other name brands. Sneaker Shopper, you are spoiled for choice. You will dream of sneaker for the next few nights. Two thumbs up for crawling. Adidas, as I might have expected, is here too in a major way. It’s all about concept. Entering ‘Adidas Stadium’ emulates the feeling of entering the game through the tunnel. Serious athletes and serious shelter wanna-be’s will feel at home here amid the myriad styles and colours of game shoes. Women sportsters a will find their own dedicated section. More to my style taste, and right across from the ‘Stadium’ is the’ Adidas Neighborhood’, an eclectic blend of sportswear, local culture atmosphere, and alternative lifestyles. Using the original brick walls of the building, the ‘Neighborhood’ exudes gritty street culture. Honestly, it proved to be a shopping experience unique in my short life. Yes, I said ‘short.’ Let’s not quibble. The Crawler found it replete with eye-catching items and twists and turns on the floor. Have a Xiaomi or want one? Don’t know what a Xiaomi is? The MI store will educate you in short order. All the selection, service, and information you would expect from this Singapore staple. Not nearly enough merchandise at toddler’s eye level – Low crawl score. There’s a Spectacle Hut, too, for the trendy in their pursuit of fashionable eyewear here, as well, the orientation is toward the active, sporty types. Here in their brand new home, ‘The Hut’ offers only the latest styles hand-fitted to comfort perfection. My next Ray-Bans will be purchased here -got them picked out. Popular Books is part of the fun mix. Books, stationery, notions, and the best plastic paper file folders you can find anywhere – you know the drill. With many stores island-wide, Popular Books has found a winning formula. No surprise they are part of this forward-looking retail mall. I’m doing it. Not only will my gently used sneakers find a useful end to their tour of duty, I’ll have the excuse I need for some serious new sneaker therapy right here in Vivo B1. From HarbourFront MRT, there’s a new escalator lobby, Lobby R, to whisk active shoppers to the new B1 Extension. It rides up from Basement 2 lobby situated right next to Kopitiam through the new retail extension at B1 and into Tangs on Level 1. This, and the design notes I’ve mentioned are part of an effort by VivoCity and retailers world-wide by retailers to up their game to answer the challenge of online shopping. Choice, appealing ambiance, a chance to meet old friends and new, eyes-on and hands-on shopping, a minimum time investment, family-friendly atmosphere – these are all part of the new retail era. On the cusp of the new — See it in action at VivoCity B1 Extension.